Vice President Joe Biden said Thursday that Egyptian President Hosni Mubarak is not a dictator and shouldn’t step aside in the face of mounting protests against his nearly 30-year rule. Interviewed for PBS’s “Newshour,” Biden said that the democracy demonstrations that have sprung up in Egypt and Yemen since protests in Tunisia ousted President Zine El Abidine Ben Ali, who had taken office in a bloodless coup and held the post since 1987, weren’t comparable to the popular uprisings in Eastern Europe that brought down the Iron Curtain. “I think the time has come for President Mubarak to begin to move in the direction that — to be more responsive to some of the needs of the people out there,” Biden said after stressing that he shouldn’t resign. Mubarak has faced growing challenges in recent years as pro-democracy youth have employed blogs, sometimes at the risk of being thrown in jail, and other social media to advance their cause. One young blogger, Kareem Amer, was released from prison recently after serving four years behind bars for insulting Mubarak. But the street protests that began four days ago have included the ruling party headquarters in Cairo being set ablaze. The Associated Press reported that demonstrators chased riot police and that some of the police even stripped off their gear and joined the protesters. Elections in Egypt have come under heavy criticism for excluding opposition candidates, banning some parties and vote-rigging. 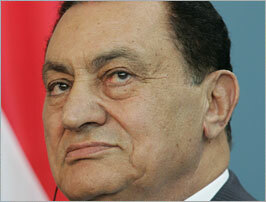 It’s widely believed that the 82-year-old Mubarak is grooming his son, Gamal, a powerful figure in the ruling National Democratic Party, to take the reins. Biden acknowledged that he knows Mubarak “fairly well,” but that he hadn’t talked to him about the recent protests. But when asked if countries will be caught up in a “domino effect” from Tunisia like that which swept across the former Soviet states, Biden said no.